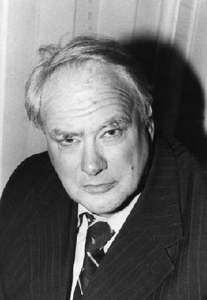 During an interview on BBC Radio 2, on the morning of April 1, 1976, the British astronomer Patrick Moore announced that an extraordinary astronomical event was about to occur. At exactly 9:47 am, the planet Pluto would pass directly behind Jupiter, in relation to the Earth. This rare alignment would mean that the combined gravitational force of the two planets would exert a stronger tidal pull, temporarily counteracting the Earth's own gravity and making people weigh less. Moore called this the Jovian-Plutonian Gravitational Effect. Moore told listeners that they could experience the phenomenon by jumping in the air at the precise moment the alignment occurred. If they did so, he promised, they would experience a strange floating sensation. At 9:47, Moore declared, "Jump now!" A minute passed, and then the BBC switchboard lit up with dozens of people calling in to report that the experiment had worked! A Dutch woman from Utrecht said that she and her husband had floated around the room together. Another caller claimed she had been seated around a table with eleven friends and that all of them, including the table, had begun to ascend. But not everyone was happy. One angry caller complained he had risen from the ground so rapidly that he hit his head on the ceiling, and he wanted compensation. Moore's announcement was, of course, an April Fool's Day joke. It became one of the most celebrated April Fool's Day hoaxes of the late 20th century. However, it wasn't just a random joke. Moore intended it as a spoof of a pseudoscientific astronomical theory that had recently been promoted in a book by John Gribbin and Stephen Plagemann called The Jupiter Effect. Published in late 1974, the Jupiter Effect's starting point was the observation that in 1982 a rare alignment of the planets was going to occur, in which all the planets, including Earth, would line up on one side of the sun. This much was agreed upon by all astronomers. This unusual planetary alignment occurs every 179 years, and had last been seen in 1803. But then the authors argued that this alignment was going to cause "one of the greatest disasters of modern times." Through an extended chain of events, it would trigger a series of massive earthquakes on Earth. Los Angeles in particular, the authors said, would be completely destroyed. The chain of events, as laid out by Gribbin and Plagemann, went as follows. The aligned planets would exert an increased tidal force on the sun. This would trigger an excess of sunspots, causing more solar particles to be flung into the Earth's upper atmosphere. The energy flowing into the atmosphere would generate stronger winds, increasing the earth's rate of spin. The faster spin would place stress on the Earth's crust, and this would, finally, bring about massive earthquakes. The authors singled out Los Angeles as being in particular danger because it was on the San Andreas fault, which they believed to be under enormous strain. They were sure that, given the slightest nudge, such as that provided by the Jupiter Effect, the fault would move violently — with catastrophic consequences. The Jupiter Effect received extensive coverage in the media. Interest in it was heightened by the fact that its release coincided with the release of the movie Earthquake starring Charlton Heston, which depicted what might happen "when the big one finally hits L.A." Also, Gribbin and Plagemann weren't just random crackpots, but were actually bona fide scientists. Plagemann, 32, was an astronomer who had consulted for NASA, and Gribbin, 28, was an assistant editor at the science journal Nature. Senator Frank E. Moss of Utah, chairman of the Aeronautical and Space Sciences Committee, became so worried by what he read in the book that he asked NASA to check into the theory. NASA astronomers responded that while they couldn't definitively rule out that the events predicted by Gribbin and Plagemann wouldn't happen, they felt it all had a very low probability of coming true. The response from NASA was typical of the response by the scientific community. Astronomers conceded that forces in the solar system might influence earthquakes on Earth. But they insisted that these forces weren't well enough understood to allow the prediction of earthquakes, and they criticized Gribbin and Plagemann for making unfounded leaps of logic that reduced their book to little more than pseudoscience. Edward Upton of the Griffith Observatory in Los Angeles was particularly harsh in his condemnation. He described the Jupiter Effect as the "Great Earthquake Hoax" and dismissively wrote that it had "the same credibility as a reading of tea leaves." Upton pointed out a variety of weaknesses in Gribbin and Plagemann's argument. For instance, during the "grand alignment" of the planets in 1982, the planets wouldn't be all lined up in a row, as the cover of the Jupiter Effect implied. Instead, they would be scattered in a spread of 100 degrees of the ecliptic (sun path). Upon noted this was an alignment "only in the sense that the spread is usually much greater than 100 degrees." Also, there had been no major earthquake the last time the planets had formed a grand alignment, back in 1803. And their decision to single out Los Angeles for destruction seemed totally arbitrary. The reviewer in the journal Science similarly wrote, "The selectivity in examining the evidence is excessive, the popularized format of the book precludes serious scientific modeling, and the correlations demonstrated are too weak to warrant practical action." When Patrick Moore joked about the Jovian-Plutonian Gravitation Effect in April 1976, concerns about the Jupiter Effect were still fresh in the public's mind. The implicit absurdity in Moore's spoof was that he replaced a grand alignment of all the planets, as was going to occur in 1982, with an alignment of only Jupiter and Pluto — the joke being that Pluto's mass is so small that such an alignment would have next to no effect on Jupiter's tidal force. I hope that this programme will be taken off immediately as it is harming the reputation of the Planetarium. And let us hear no more of this nonsense about the 'planetary alignment.' It happens every 170 years or so; nothing spectacular will be seen in the sky; and in the opinion of almost everyone, it can effect nobody and nothing. What ultimately reduced the Jupiter Effect to obscurity was the fact that none of its predictions came true. Los Angeles survived 1982 unscathed. But even before 1982, Gribbin and Plagemann had begun to back off from their theory. In an article in New Scientist (Jul 17, 1980), Gribbin conceded, "Our forecast of peak solar activity coupled with increased seismic risk in 1982 was wrong." But he continued to believe there was a strong link between solar activity (particularly sunspots) and seismic activity on Earth. 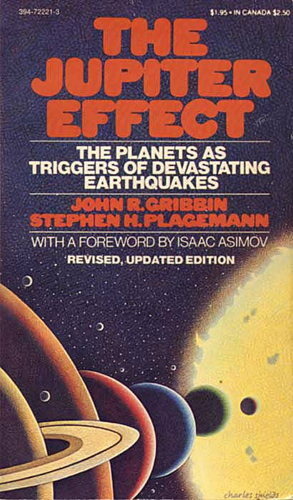 In 1982, Gribbin and Plagemann came out with a sequel, The Jupiter Effect Reconsidered, in which they revised the theory to suggest the effect had actually taken place in 1980, and that it had triggered the volcanic eruption of Mount St. Helens. However, the sequel didn't sell as well as the original. By 1999, Gribbin had repudiated the Jupiter Effect theory entirely and wrote, "I'm sorry I ever had anything to do with it." Weightless on the Planet Earth? I say: Moore fool you. Gribbin, John (Jul 17, 1980), "Almost a famous forecast," New Scientist: 226. "Jupiter Effect: Mixed Reaction" (Sep 28, 1974), Science News, 106(13): 197-198. Kaula, William (Nov 22, 1974), "The Next California Earthquake", Science 186(4165): 728-729. Moore, Frank (Jan 17, 1975), "With a Grain of Salt", Redlands Daily Facts: 12. Moore, Patrick (Sep 20, 1979), "By Jupiter", New Scientist: 907. Whatever it was they were drinking, they should have put water with it. This prank shows how peoples mind's play with them when they THINK something is going on. The "sensation" is COMPLETELY sychological OR is made up. That woman is hularious, and MUST have felt stupid after finding out it was all a joke!! So I've kind of met Einstein once removed. Actually, if the brain really believes a thought to be reality, it will respond to the "fact". Not saying this lady and her friends flew around the room. Am saying that the body would respond with physical sensations even if the body was not floating. Years ago, I did not know the Equinox/egg-standing thing was a myth. So when I woke up on a day of the Equinox, I remember thinking "oh, it's the equinox" and I groggily walked into the kitchen (half asleep), grabbed an egg from the fridge and placed it on the counter on its end. There it sat for about 20-30 minutes before I used it for my breakfast. I've since learned about the probability of "egg standing" but it certainly was cool to accidentally come upon it because my brain knew how to respond to a thought I had filed as fact. 1. Always count on human stupidity. 2. Placebo effect on 30%. I'm going to have to agree with Ian on this. The woman who said she and her friends floated around the room was clearly just playing along with the joke. I've never understood how someone can hear someone say something THAT absurd and think that it's a very stupid person being serious instead of a normal person joking. It just goes to show how much information people retain from science class. How many light years are we from Pluto? Isn't there a Mark Twain story about a Connecticut Yankee that goes back to middle ages and uses an eclipse to trick the simple minded folk. Wow - not much has changed huh! "It just goes to show how much information people retain from science class. How many light years are we from Pluto?" Well in response to that: we're 4.28 * 10^12 metres from Pluto, at minimum distance. Light travels at approximately 3* 10^8 m/s in a vacuum, which is what space is for all intents and purposes. So one simply divides the distance by the speed, and comes up with the answer 1.4267 * 10^4 seconds. Which is 14,267 seconds. So we divide that by (60^2 * 24 * 365.25) to get our distance in light years. Which is 4.521 * 10^-4. So if we're going to the nearest light year, we're actually no light years away from Pluto. Shows just how much information people retain from science lessons. Although, it is rather far fetched. As I'm sure we all know gravitational force is the weakest of allthe forces; and Pluto being quite small and a reasonable distance away the effect on each of us being VERY small is negligible. Having said that, Patrick Moore is an incredibly respected astronomer and the average Joe wouldn't have had any reason to doubt him. It's not all that far fetched that so many people would believe him. The same with Panorama's spaghetti trees. Patrick Moore is very famous in Britain, he has his own BBC TV show. Most people will have heard of him. ""It just goes to show how much information people retain from science class. How many light years are we from Pluto?" Posted by Comedy James on Sun Apr 02, 2006 at 06:36 AM"
Damn. Beat me to that one, but well done old chap. Can't bear sanctimonious hypocrites. Since when did Jupiter and Pluto's gravity have an impact on us? If Pluto passed behind Jupiter, there would be no gravity interaction whatsoever. I think that lady who said she'd floated should have stopped taking whatever she was taking. mayby they were trying to get some money from the interviews, that doesnt seem so stupid to me, just opportunistic. Did it occur to anyone that maybe the many people who called were going along with it to play their own joke. I can see me stringing them along. it really did happen. the interesting thing is that in order to get word out to the masses, the information had to be leaked to a radio station under the guise of a pratical joke. otherwise, nobody would actually know about the event and have taken advantage of it. disk jockeys are so gullible. Judging from the comments and the language on this forum, some here who think they could not be fooled, are showing themselves not to be the brightest bulbs on the block. And as far as what Christians believe about how old the earth is and how they don't believe in evolution, what do you care if they believe it? Is it hurting you in any way. I doubt it. Here's something to think about.... Christianity is not a "religion" or a concocted belief. It is a relationship with Jesus, who is our God and our Savior. If you were in a fire and someone rescued you from that fire but lost his own life in the process, would you love and respect that person? If someone gave his life for you, would you love him/her? basis in scientific fact. Noone will dispute that the tides are influenced by the proximity of the noon, and likewise, a person's body weight can vary as much as eight lbs. between high and low tides. Really though, people are making fun of people for believing it... If a famous scientist stated that nowadays on the news, Most of you making fun would have believed it! Instead of a household of people, whole towns would have called saying they felt it! This I can promise you all. I think these people felt that sensation because they wanted to. I haven't read all seven pages of comments, but the tone of the first page or two seems rather derogatory towards the flying lady. My first thought, though, was "Well done!" I wonder if she's still laughing at the people who didn't realize she might have been playing her own April Fools' prank? Hey Reece - You're absolutely correct ! You caught my typo. Congratulations!!! Of course I meant moon, not noon.